Great News: Details of Post-Fest One-day Tour in Hong Kong, Take a Look! 下載完整版場刊 (1) (2) Download the official Brouche for full details (1) (2). 購票詳情：） Ready for your seats? 20100916 英國聾人電影工作者 Bim Ajadi 主持的工作坊己圓滿結束，歡迎瀏覽相簿！Bim Ajadi, the renowned Deaf Filmmaker, HAD the Pre-Fest Workshop already! Wait, share the joy, the Album is still for FREE. 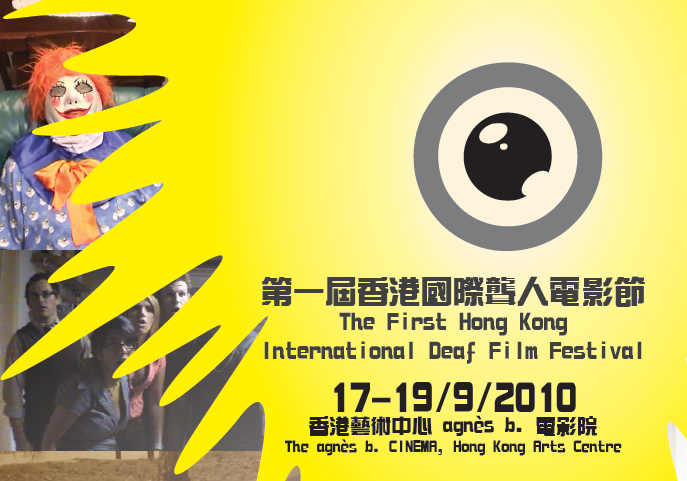 20100916 傳媒消息：電影節受兩岸媒體重視 Mass Media Digest: The Festival is catching attention in Beijing and Taipei! 20100903 更新「短片創作比賽」詳情 Details to Short Film Contest Updated! 20100903 新增文摘＜聽說聾人也有文化公民權＞　An Article related to "Cultural Citizenship" Added, written by Xavier Tam. 20100831 購票詳情 :) Folks, it's time to get ready for your seats! 20100828 電影節文宣，有得睇喇！ Take a look at our fabulous Brouche! © Copyright 2010. HKIDFF. Best View with Google Chrome.